[2012-2018] When I was talking with Talenti, and they offered to send over all the new pints, I asked them a favor. Since I've already tried the excellent new German Chocolate Cake flavor, could they maybe sneak in the strawberry flavor in it's place? 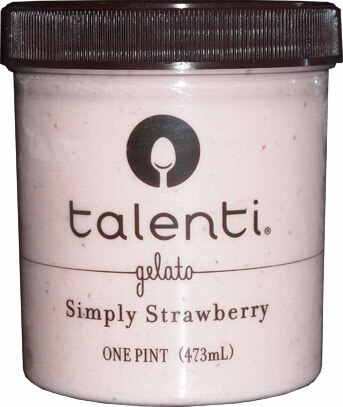 You all know that I adore a good strawberry ice cream but I've just never been able to find this version. Ohhhhh the anticipation.... and the confession: it was 7AM, it was like 80 degrees and humid outside, and I had this one for breakfast. Sorry, the light pink coloring doesn't come across too well. Ok, this photo is better, but still not perfect, but at least you can see the strawberry bits! I take a few bites and as expected, it's very well made. It's not a strong strawberry flavor, but it's natural and real. Nothing fake or crazy going on here. 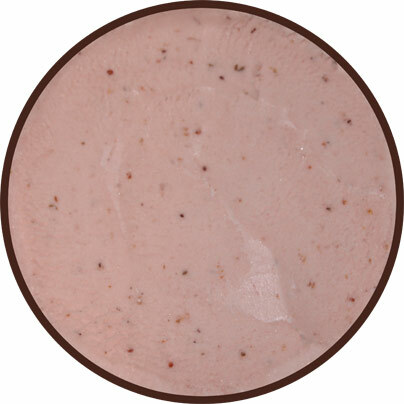 It's a slow scooping flavor, no need to rush through it since there's no mix-ins to uncover. Just sit back and enjoy the simplicity. You know what? This ice cream makes me a little sad. No really, stick with me here, I have a good point. The gelato, this excellent frozen product before me, is too simple for our complicated world. Just look at those ingredients. 1 - Milk. 2 - Strawberries (and then the other stuff). It's not some huge long list where "artificial strawberry flavor" clocks in as ingredient #17. Strawberries should always be prevalent in an treat like this. That's all we really need. In a world chock full of swirls and mix-ins and chemicals, do we even know how to appreciate something like this anymore? Maybe I'm just sad that I can't buy this anywhere. I don't know whether to eat the pint or give it hug. I'm pulling a nosh show rant aren't I? Ok, back to the review. This one is really well done. The visuals kind of say it all. Nice job Talenti. On Second Scoop: Man I'm enjoying this. I don't know how you would make a better all natural strawberry flavor because I'm just not in to big strawberry bits, this is perfect just like it is. 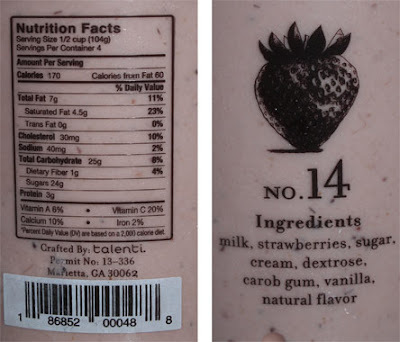 It's interesting that you wrote that,"It's not some huge long list where "natural and artificial strawberry flavor" clocks in as ingredient #17." No, "natural flavor" clocks in as ingredient #8. Right behind "carob gum" at #6. I think that they could have left this one a little simpler. @TT: ha, got me. yes, 'natural flavor' clocks in last, but I was thinking of the strawberries as the natural flavor, I may have to adjust my wording. All I know is that this sure beats frozen dairy dessert! What is odd about this is that I looked for this particular flavor and no store within 200 miles has this. They have almost all of their other flavors. What gives? Super hard to find, no idea why! This one's always available in Ohio! Just had it the other day. I, sadly, have not been able to find this flavor either! WHY?!!!! I have looked everywhere!! !